Yesterday, CEI’s Chris Horner testified before the Ohio House of Representatives Committee on Public Utilities, on legislation to modify the state’s existing green energy production quota by expanding the number of electricity generators that qualify as clean energy. Below is his presentation and written testimony. Good morning, Mr. Chairman and members of the Committee. My name is Chris Horner, I serve and appear today as Senior Fellow at the Competitive Enterprise Institute in Washington, DC. I also work with other, similar groups in the U.S. and Europe well all deeply involved in energy and environmental policy. In these capacities I have extensively researched and written about environmental regulation, the energy industry and related policies and, particularly in the past few years, renewable energy and ‘green jobs’ programs. The Committee today is considering an amendment to modify an existing advanced and renewable energy mandate, to expand the universe of projects which would qualify. Such mandates are not programs I favor for, among other reasons, the very same realities which have led the schemes to cause such economic havoc in European countries, which nations our president repeatedly cited as the model for renewable energy schemes here. For some reason, he no longer cites these examples, although he does continue to push the same programs, just no longer stating which success stories they seek to replicate. These countries — years ahead of the U.S. in their experimentation, which experiments they have not yet found a way to unwind after confronting the enormous costs — were presumably also the models touted as success stories in promoting states to also adopt renewable mandates and support schemes. Of course, on a more general level, CEI and other market-oriented groups oppose this sort of support scheme because products which require mandates in order to have a market have numerous good reasons for why they are not widely in use. Regardless, I acknowledge that improving such provisions to allow consideration of reliable, affordable energy sources is better than not doing so. Expanding the universe to recognize use of more practical “advanced” energy sources not only should help mitigate some of the harms these larger schemes visit upon those who must pay for them, but it also encourages actual advances in energy production, which is a key nominal objective of such programs. The statutory provision at issue was adopted at or near the height of the “green energy” fad, the arguments promoting which all fail scrutiny. The amendment would help balance the impacts of forcing less efficient, intermittent energy sources representing — and sometimes even requiring new — capital redundancies. It is my experience that no one argument typically is cited as justifying such schemes, which is itself telling. Touting a litany tends to distract and deflect scrutiny, and scrutiny does not treat any one of the claims well. For example, despite the persistent talking point that wind and solar are somehow “new technologies”, the fact is that wind, solar and coal-fired electricity are contemporaries, each commercialized within ten years of each other in the late 19th century. As a general proposition policy should not prejudice developments or improvements in efficiency in any one or another of these, regardless of however fashionable some manage to portray themselves as being. That is the epitome of the disdained practice of “the government picking winners [sic] and losers”. But to do so on the mythology that longstanding failed competitors are now actually new breakthroughs is even less justifiable. As such, the proposal to codify recognition of other energy technology as “advanced” is certainly a step in the right direction. A quick trip down memory lane as to how we got here is in order, such that “the clean energy economy” is now the principal focus of the same people who previously pushed the same agenda, but styled as something completely different. The same agenda — even, as I shall note, the very same legislation — was formerly styled in the name of “global warming”. The federal legislation to mandate use of these technologies — in fact, the second phase of the plan to impose Solyndra et al. on our economy, the anticipated creation of a mandatory market for all of the equipment whose production the taxpayer was being forced to subsidize — was the Waxman-Markey legislation in the U.S. House of Representatives. This bill passed the House, and was known popularly as the “cap-and-trade” bill. After the political fallout from that vote appeared serious, a former pollster for President Clinton named Stanley Greenberg advised his clients to recast their proposal, because the public wasn’t accepting programs in the name of “global warming” or “cap-and-trade”. He advised them to re-brand the plans as promoting “clean energy”. That is of course what happened. The scheduled Earth Day press conference to introduce the Kerry-Lieberman Senate equivalent was canceled, with Sen. Kerry telling the press, “This is not an environment bill.” When finally rolled out, the name had changed to the Kerry-Lieberman American Power Act. It was now a “jobs” and “clean energy” bill. True, it was the same program. It amended the Clean Air Act. But the polls said it had to be styled as something different, if still demanding urgent policy action. This provides some needed context, as well for when considering the idea that renewable energy mandates are a way to spur the United States to become a world-leading exporter of politically selected technologies — and create jobs, allow “new technologies” the “chance to compete”, to engage and possibly win a “race with China”, and any other among the litany of co-benefits which collectively — we are told — demand adoption and evergreen-renewal of support schemes. As to the original rationale, “climate change”, former EPA chief Christine Todd Whitman defended President Obama from complaints by Al Gore about Mr. Obama being insufficiently evangelistic about the global warming agenda. This prompted Politico to write “With Congress unlikely to push climate legislation anytime soon”, Whitman defended Obama, saying “‘he may not talk about climate change so much – but will backdoor [it] through clean energy’”. He is surely right in his implication, given that no climate model projects a detectable climatic impact even from perfect implementation of the Kyoto Protocol, and therefore it is, indeed, far more reasonable to conclude that the plan is about what it would do, rather than that about which it would do nothing. Surely these programs are in any way about wealth creation, or as others put it in promoting renewable energy mandates, “the way out” of the current economic downturn. Experience in our erstwhile models in Europe affirm this, so it is a good thing that our president instructe us to examine their experience for insight into where he sought to take the U.S.
Today, the talking points in defense of the fallen poster-child for such support schemes, Solyndra, are largely the same talking points for the agenda that brought us the Solyndra debacle. I will be pleased to take questions on the fallacy of any or all of the litany. But first, a few more points on what we have learned in the time since Ohio’s renewables law was adopted. We must bear in mind a bigger reality, despite pleas to wear blinders and only notice what can be immediately pointed to — that is, temporary installation jobs, the odd continuing maintenance position, possibly a ribbon-cutting ceremony for a new facility that, as soon as the mandate or wealth transfer ends, inevitably packs up and heads to the next new mandate and wealth transfer. These are what Frederic Bastiat noted are “the seen”, and that we ignore, time and time again — always at our peril, and to our detriment — “the unseen” that results from such interventions. There are other things that result, indeed economic harms, from politically directing capital and from increasing energy costs, forcing less reliable and more expensive energy sources into the market that need governmental intervention in order to have a market to speak of. This does more than just transfer wealth, from people who use energy to entities experiencing what in any other context is called a “windfall” thanks to this act of government. Worse, it inescapably means the cost hits everyone, most particularly seniors and the poor, anyone on a low- or fixed-income is hit first and worst. And so these schemes inevitably carry “insurance” policies such as caps and/or ratepayer assistance, quietly acknowledging the truth. Yet despite programs seeking to selectively mitigate these impacts that President Obama rightly said were “necessarily” the impact of such schemes, they cannot help but still carry negative net economic consequences. As such, we see one more reason, in addition to mere equitable considerations, to expand the universe of what is allowed to be used to meet any requirement for advanced energy technology. That which is being forced into place is not in place for numerous good reasons. Policymakers are therefore subjected to a relentless and broad-based campaign insisting these things should be in place and, when they are, economic and social magic will follow. However, making production less efficient does not actually create wealth. The benefits turn out to be less than the cost, usually temporary employment for some while rewarding parties who would not be rewarded but-for political or policy intervention. Remember, those places where we were previously told to examine we are no longer told to examine, because the reality of their experience has come out: these programs are net job killers which prompt various other policy moves to manage these costs and, worse, they are very difficult to get out of once in place. It is true that a state or country can mandate the use of whatever it can politically get by with mandating. But since we are speaking about energy, we have learned that indeed this means that you are almost guaranteeing the least-cost units will be made somewhere where their use is not mandated. Someplace where it is still economic to make things that require much energy. With jobs on everyone’s mind, the net economic impact of a program should rightly be policymakers’ primary consideration. As such, I address what continues to be the lead or a lead argument for ‘renewable’ energy mandates: ‘green jobs’. Recall how the “cap-and-trade” and renewable mandate legislation, Waxman-Markey, was also quickly rebranded a “jobs” bill by then-Speaker Nancy Pelosi on the floor of the House. You should consider those jobs that these programs create as “bubble” jobs, which a) depend upon more and more being pumped into the bubble to keep these initial jobs going, b) have nonetheless proven to carry extremely expensive per-job costs, and c) are largely temporary anyway (installation). The term ‘green jobs’ generally refers to a series of support schemes ensuring more man-hours per unit of energy produced. That is, ensuring more expensive, less efficient energy. As Napoleon boasted (to the mockery of Bastiat), ditch-digging and re-filling programs “create jobs”. Of course, there is nothing this body could mandate the public do that wouldn’t “create jobs”. If you limit yourself to “the seen.” This is not true on net, however. Raising electricity rates and lowering the disposable income of the general public may create jobs for a few, but lowers the level of prosperity for the general public. So what else actually occurs — as proven not only over history as a general proposition, but in those no-longer-cited laboratories of success, our economic models, the European economies — makes the claim that these schemes are actually, somehow, the way out of the economic downturn more curious. Requiring more labor per unit of energy produced is a proposition whose logic is inherently contradicting, of course, since our use of energy is designed not only to make us richer and safer, but to be labor-saving. It has obvious economic impacts, but on net these are negative. They are positive only if one wilfully wears blinders, seeing only that which proponents of such programs want you to see…ignoring all else that results from the programs. We have even seen one industry (solar) boast that it is the most labor-intensive of all energy sources, even convincing lawmakers to repeat the claim as a virtue. This indicates the U.S. could be the most prosperous country in the world if we only hooked up electrical generators to bicycles, treadmills and giant cranks for the workforce to run on, ride on, or walk around turning at eight-hour shifts. As economic policy or an argument in one’s favor, however, it is absurd. More recently, the man who is now President Obama’s chief science advisor, the climate activist John Holdren, used to publicly argue that we had too much energy, and that less efficient energy was much better for the economy because it required more workers. This is an extension of the newly fashionable argument that our economic troubles are due to automation, from ATMs to the horrors of ticketing kiosks at airports. Presumably shovel-ready jobs were a bad idea at the outset because they should properly have been spoon-ready, instead. Regardless, “jobs” is not an argument. There is no program that does not “create jobs” in the same way that these schemes do. Carol Browner and current EPA chief Lisa Jackson both insist that more regulation means more jobs because, after all, if they require you to prematurely retire capital or spend money on some equipment, why, you’ll have to hire someone to do it! To confuse this with positive economic activity is not just reckless and uninformed, it is commonplace. Just as renewable energy is a very expensive, and possibly the most expensive, way to reduce emissions, and the most expensive way to produce energy, it is probably the most expensive way to create jobs. As reported by the Washington Post, the administration’s own claims of the per-job cost of green jobs that it identifies as having created are as high as $445,00 per job. This figure is averaged; numerous instances exists of projects having per-job costs spectacularly higher. Also remember, these are temporary jobs dependent upon conintued political intervention. Then there is “Michael Eckhart, president of the American Council on Renewable Energy [who said China has] ‘won manufacturing… Game over, exit the stadium’”. That acknowledges that the U.S. will not somehow become a world leading exporter of renewables by mandating their use here, and indeed it belies the public sales pitch for massive ‘green jobs’ schemes. It does, however, reaffirm what scrutiny of even those studies claiming net job gain from green jobs schemes reveals: not only will they not replace lost jobs in America, they won’t replace the additional jobs their support schemes cause to be lost. Such jobs last only so long as the mandate and wealth transfer continues. Remember, the mantra that this is “jump-starting” industries begs the questions: ok, which of them say they can walk away from the trough after the jump-start? None, of course. That’s just rhetoric to rebrand a certain poll-tested brand of corporate welfare. Consider the solar industry that we have “jump started” with decades of subsidy and other support schemes. A recent earnings call saw First Solar CEO Michael J. Ahearn cite the following explanations for his industry’s struggles: “Declining subsidy pool”, “Shrinking subsidy programs”, “European countries reducing their subsidies”, “No significant new state-level solar programs”, “Moving downward in terms of subsidies”, “A much lower subsidy level”, “Solar industries feeding mostly off of legacy subsidies in California”. Also consider how installing this equipment now, which requires tewnty or more years of guaranteed, above-market rates, locks the ratepayer in to high prices which they are told will be coming down, fast, for equipment not quite ready which we are told is about to confront real breakthroughs. Here we see an object lesson in talking points promoting program undermining themselves, with no rebuttal required. Further, most other programs to “create jobs” create the jobs much more cheaply, without the knock-on effect of higher energy costs requiring schemes to mitigate the impact on seniors and the poor. Tahtis to say, paying workers to dig ditches and fill them up again is less economically harmful — that is, more wise — than “green jobs” schemes. Regardless, energy policy should not be a jobs program. And if it is, go where the ‘real’ jobs are. Sustainable jobs are those producing and capitalizing upon viable energy sources. Which lead to more jobs in broader economy, not fewer net jobs. Productive economic activity flows from lessening the burdens being piled on top of industry, including those trying to produce more efficient energy sources (who see public and private capital misdirected to politically determined sources). Encouraging instead, e.g., more and amore advanced methods of producing and using domestic oil, coal and gas would create jobs in those industries but also throughout the economy. North Dakota is booming, tapping domestic energy resources. California, obsessed with politically correct “renewable” energy mandates, is teetering on the brink of collapse. These are not coincidences. The argument “green jobs” turns logic on head. Since everything “create jobs”, touting this as the rationale isn’t an argument, but an admission that one has none. As the above quotes from industry supporters Messrs. Eckhart and Glaeser indicate, it seems that even interested experts agree that these programs will not lead to a U.S. economic or jobs boom of any sort. The best one can hope for is a debt-funded bubble, which must burst, and Americans have too much recent experience with such bubbles to accept seeing policymakers repeat it. At the per-job costs already seen both here and in Europe, that bubble is ever less sustainable. Although we are no longer told about the spectacular success in creating green jobs in Europe let’s look anyway at those we were previously told were our models to follow, and what really is happening in those laboratories of bureaucracy, the European Union Member States. Austerity-whacked Europe is rolling back subsidies for renewable energy as economic sanity makes a tentative comeback. Green energy is becoming unaffordable and may cost as many jobs as it creates. But the real victims are the investors who bought into the dream of endless, clean energy financed by the taxpayer. They forgot that governments often change their minds. Spain is famous for its housing bubble, whose bursting drove the national unemployment rate to 20 per cent-plus. Less well known is the renewable energy bubble, inflated by a government bent on shaking down the taxpayer to subsidize clean energy – a social program disguised as a politically correct industrial program. German families pay the secnd-highest electricity costs among the 27 members of the EU (22.9 euro cents per kilowatt-hour, 39 percent more than the EU average of 16.5 cents)(erstwhile Obama model Denmark, which he inexpliciably substituted for Spain once Spain’s reality was exposed, has the highest residential rates). Yet a late January headline in Focus Magazine read “Es wird dunkel in Deutschland” (translated: “It gets dark in Germany”). We have also seen widespread warnings that the politically driven obsession with creating jobs by trying to be the leader in solar power threatens to “collapse” Germany’s electricity system. [A]lthough Germany’s promotion of renewable energies is commonly portrayed in the media as setting a ‘shining example in providing a harvest for the world’ (The Guardian 2007), we would instead regard the country’s experience as a cautionary tale of massively expensive environmental and energy policy that is devoid of economic and environmental benefits. Any result other than a negative net employment balance of the German PV promotion would be surprising. In contrast, we would expect massive employment effects in export countries such as China. While such projections convey seemingly impressive prospects for gross employment growth, they obscure the broader implications for economic welfare by omitting any accounting of off-setting impacts. The most immediate of these impacts are job losses that result from the crowding out of cheaper forms of conventional energy generation, along with indirect impacts on upstream industries. Additional job losses will arise from the drain on economic activity precipitated by higher electricity prices. I have come to oppose solar photovoltaic power (PV) in the UK, and the feed-in tariffs designed to encourage it, because the facts show unequivocally that this is a terrible investment. There are much better ways of spending the rare and precious revenue that the tariffs will extract from our pockets. … Money spent on ineffective solutions is not just a waste: it’s also a lost opportunity. Environmentalists have no trouble understanding this argument when lobbying against nuclear power. Those who maintain that it’s more expensive than renewable electricity argue that we shouldn’t waste our money investing in it. But now I hear the same people telling us that we should support every form of renewable generation, regardless of the cost. More broadly, European countries previously cited here as models to follow — but which, upon scrutiny, turned out to merely have made this mistake so we don’t have to — are desperately scrambling to mitigate the damage, but against the headwinds of tremendous political pushback from the constituencies they created and nurtured into the equivalent of our own ethanol industry (with which the parallels run deep). Other countries offering specific examples where support programs have had to be scaled back, which I have previously provided in a statement to the U.S. Senate Committee on Environment and Public Works, include Spain, Holland, France, Italy, and Denmark. Most disturbing is that, although promoters no longer cite these as examples, their policies are nonetheless still being promoted. The gross effects of job creation are numbered in the millions (3m), but the net effects, even under the optimistic export scenario above, are numbered in the hundreds of thousands (400k), and are not uniformly positive for all EU states. GDP effects are fractions of a 0.5% in 2020, even on optimistic assumptions about trade. These are very feeble benefits for what the gross employment figures tell you is an enormously disruptive rebalancing of the European economy. Put another way, the EU renewables strategy is a gamble where the stake is enormous, the risk of losing is high, but the reward for winning is very modest indeed. In other words it’s economically reckless. There are signs of unease in the Trade Union movement. An extreme left wing grouping, the Campaign against Climate Change, estimates that the results of their very enthusiastically endorsed green policies mean the direct displacement loss of 594,000 jobs in UK motor manufacturing, road transport, and aviation over twenty years. The only remedy they can find is for the government to employ 1 million people in a National Climate Service. This is febrile and unbalanced, but revealing of deep concerns nonetheless. One distraction has proved persistent within the repertoire even as others get tried out. It is a new utilitarian “green” talking point, applied so far to the entire suite of folly, from electric cars to windmills, and thus deserves response. This is that we must make bold moves on this front or face the prospect of falling behind China in the great [insert green scheme here] race. Steven Chu, the federal Secretary of Energy, speaks regularly of the “clean energy race”, specifically focusing on China and fears that they will “win” it. Americans should be far more concerned about Belgium producing better beer, chocolate and Brussels sprouts than us than over the prospect of China developing a superior solar panel. This loses sight of some important factors. Such as, it’s a solar panel…or a windmill; not a breakthrough, new energy source (see “Not ‘New’, Not of ‘the Future’”, immediately below). The truth is that China’s edge is in mass producing commodities. Not innovating. Further, we should not fear that China will leave us on the outside of their solar panel or windmill nirvana looking in, beholden to them. China only built up a solar panel industry to sell them to us and other Western nations pursuing the “green energy” fad. Cluttering their own energy system with solar was never the objective; with their customers now broke, they just rushed to institute a feed-in tariff to force a domestic market until Western nations recover sufficiently to resume the binge of buying solar panels. As regards wind, China was installing windmills largely because Europeans were paying them to under Kyoto’s Clean Development Mechanism. Often, it turned out, they were not actually hooking the windmills up, as that is expensive and disruptive. The deal was to install them, to provide Europeans their “credits”. So if you don’t want us to buy solar panels from China, don’t pass laws requiring us to use solar panels. Otherwise, we’re going to buy solar panels from China. Things that exist solely due to political divination, not for reasons of their economics or performance, are essentially commoditized. The low-cost producer will always win, and on this front it will never be us. Why not admire and emulate that which China is doing that actually drives its prosperity: a sincere commitment to building coal-fired, nuclear and hydroelectric production? If Western political leaders stop forcing uneconomic energy sources into the economy on the argument that, well, we should be making and using them — despite there being many and very good reasons that we do not — the Chinese will retool their industry to make something else. They clearly have not decided that their future energy will come from windmills and solar. The more legitimate fear is not that we lose some mythical race to China but that we succeed in turning into the country President Obama cited eight times as his model to examine if we want to know where he’s going: Spain. We should constantly ask ourselves, whatever happened to the European boogeyman previously invoked to convince you we simply must accept this industrial policy, and when and why did it suddenly flip to be a still largely impoversihed, communist country premised on command-and-control and dirt-cheap labor, cashing in on a politically created export market to those who dare to force the machines into their own energy system? What happened to our European models is that, after decades of tossing their own billions at these schemes, they lost their industry to China. Spain, Denmark and any other model Mr. Obama used to cite but no longer does are experiencing this. This includes the somewhat persistent German model. For reasons stated above. The key is to note they are no longer models. Now it’s suddenly China. If China’s deal is on offer — what it’s really doing — we should snap it up in an instant. But we are being sold a myth. We cannot begrudge China for taking advantage of us — and our willingness to believe that energy sources which have taken on totemic significance but which are still more than a century old — represent breakthrough developments. But neither do we need to enable them. Talking points promoting policies forcing uncompetitive, uneconomic and inefficient “renewable” energy into markets where they otherwise would not be, have become increasingly confused. We are told that, unless we impose mandates to install renewables now we will fall behind in a race for new energy sources. They are in their infancy, apparently, although the industry cannot quite make up its mind about that claim. This is also of course betrayed by history — wind, solar and coal are contemporaries when it comes to producing electricity. This can be difficult to keep in mind with all of the mysticism attached to anything labeled “green”. But solar- and wind-powered electricity generation were first patented in the late 1800s, less than a decade after coal-fired electricity was brought on-line, and Music Men have sauntered through political capitols ever since vowing revolutionary this and that and cost competitiveness just around the corner. It’s always been just around the corner, and always will be. And if it were cost competitive, no such mandates would be required. But we are told they are. Still, talking points supporting these schemes, even out of the White House, also often call windmills and solar panels ‘new technology’, ‘the energy of the future’, or ‘nascent’. Yet Presidents since Richard Nixon have called for moon-shot style spending programs on these schemes. 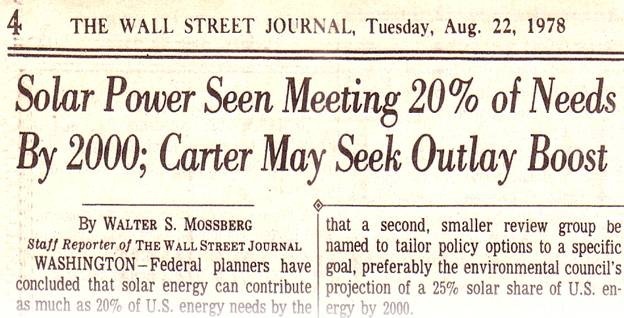 An infamous Wall Street Journal headline from 1978 discussed Jimmy Carter boosting outlays for something we are told “it’s time we began investing in”. And the premise was, then as now, that it (solar) could provide of to 20% of our needs… by the year 2000. So here we see a hint of the history of failed promises, and the hollowness of contemporary rhetoric. Incidentally, solar’s share of U.S. electricity is still mired around 0.2%, not 20%, providing some perspective on Ohio’s mandate of at least 0.5% for solar power. Mandating or coercing capital to pursue newly packaged versions of old failures actually delays technological innovation. And it remains true that, barring an actual “breakthrough” in energy storage technology, these will never be what they are sold as: “alternative energy”. To be an alternative something must of course be an alternative. Being intermittent and not available when we need it, where we need it, disqualifies modern “alternative” energy from that label. They take a lot of space to produce a little, yet continue to receive massive subsidies simply because they have been politically chosen. The amendment this Committee is considering will at least somewhat mitigate that stranglehold and some of the distortion. After billions of dollars of supports directed specifically at them for what they are, not for what they can do, their supporters still speak in terms of “isn’t it time we began investing in…” This admission that we essentially remain where we started proves far too much, one should think. As regards the one of several dissatisfying arguments advanced, it also seems that reducing emissions through windmills and solar panels is quite possibly the most expensive, that is, least efficient, means of reducing emissions. That is if they reduce emissions at all. For example, according to the California Air Resources Board, it costs $133 per ton to reduce carbon emissions through the mechanism of a renewable electricity mandate (but note that the CARB estimate is based on replacement of primarily natural gas fired generation, not coal as is the case for most of country, and on outdated natural gas price forecasts; and before ‘fracking’ expanded domestic proven reserves by 40%). It is important to also note that these studies do not include the cost of backup capacity nor of transmission requirements (incrementally higher transmission costs than conventional), both of which are considerable. After seeing an internal White House memo about the efficacy and wisdom of these ‘green jobs’ programs, the Wall Street Journal wrote of how the schemes stick taxpayers with risk properly borne by investors and, in the event of success, the taxpayer is excluded from the upside. In short, this “political allocation of capital” perverted market economics. Market-driven energy choices are cutting more tons of CO2 in the U.S. than have been cut by wind and solar—even with their billions of dollars in subsidies. Natural gas-fired electricity generation has grown from 15.8 percent of America’s power generation in 2000 to 24.1 percent in the most recent 12-month tally from the Energy Information Administration. That 8.3 percent increase is enough to cut 120 million metric tons of CO2 per year compared to coal. Over the same span, wind- and solar-generated power grew to 2.75 percent of total power generation. That would cut CO2 by 108 million metric tons per year compared to coal power. So over the past decade, hugely subsidized wind and solar have done less to cut CO2 emissions than market-driven natural gas production. We are told that it’s time we begin investing in that which the taxpayer has already been forced to spend billions on over numerous decades to painfully little avail. We are told that energy sources which undeniably are not “alternatives”, and barring an actual and unforeseen breakthrough will never be, represent our best “alternative” energy. They represent efficiency improvements on old technologies, whcih, in their case and theirs alone, qualifies them for the label “new technology”, even “nascent”. That is surely an artificially uneven playing field. Indeed, that very rhetoric promoting “renewables” is an admission that we remain where we started decades ago, at square one, despite these scores of billions in supports here and scores more elsewhere. It is hard to imagine a more compelling admission of failure, and exhibit in support of re-evaluating continued supports. We do not know for sure that Solyndra will put an end to politicians’ profligate pouring of debt-financed wealth down this drain. But, in the event this proves out, the half billion Solyndra cost us will also prove to have been worth it. In the meantime, CEI supports educating Americans on the ‘green jobs’ and ‘clean energy economy’ theories, one talking point at a time. Our elected policymakers must begin showing more restraint before embarking on a vast compounding of the dilemma that ethanol supports have created, from which, politically, we apparently have found no way out. Already we see the further pain being caused in Europe, our supposed, now former models on these policies, as they, too, struggle with extracting themselves from the “clean energy economy” they sought to create, often with good intentions, but insufficient consideration of the realities. As one gas lobbying group (ANGA) openly acknowledged in television ads, they push the “renewables” agenda because, as they put it, more renewables means more gas. Which is an admission of the inescapable: renewables naturally require “backup”, and their intermittency makes coal a less preferable reliable power source to keep the lights on than gas. Which is to say, it begs building new, redundant generation as well, all of which cost is passed on to the ratepayer, meaning the economy. How forcing inefficiency into the economy makes sense is a topic on which reasonable minds argue regularly. How it makes sense now, particularly after “stimulus” spending, much of it very similar to this, failed so dramatically is less open to reasonable dispute. “Democrats urged to play down ‘global warming’”, Washington Times, June 19, 2009, http://www.washingtontimes.com/news/2009/jun/19/party-memo-urges-democrats-to-fix-pitch-on-climate/?feat=home_headlines. See, e.g., “Morning Energy”, Politico June 23, 2011, http://dyn.politico.com/members/forums/thread.cfm?catid=22&subcatid=76&threadid=5591431. Quoted in “«Klimapolitik verteilt das Weltvermögen neu” (“Climate Policy redistributes the world’s new wealth”), Neue Zurcher Zeitung (Switzerland)November 14, 2011, http://www.nzz.ch/nachrichten/wissenschaft/klimapolitik_verteilt_das_weltvermoegen_neu_1.8373227.html. Quoted in “The Climate Cash Cow”, Investors Business Daily, November 19, 2011, http://news.investors.com/ArticlePrint.aspx?id=554439. “That Which is Seen, and That Which is Not Seen”, Frederic Bastiat, 1850, available at http://bastiat.org/en/twisatwins.html. Thomas Lee, Ben Ball, Jr., and Richard Tabors, “Energy Aftermath”, Harvard Business School Press (1990). See, e.g., press release, “AS CONGRESS LOOKS TO NEW JOB CREATION LEGISLATION, SENATORS ASK OBAMA AND REID TO CONSIDER SOLAR MANUFACTURING BILL: Menendez, Stabenow, Bennet, Wyden and Gillibrand tout job creation benefits of Solar Manufacturing Jobs Creation Act”, November 30, 2009, http://menendez.senate.gov/newsroom/press/release/?id=f5a21c37‐22c2‐465b‐994e‐c57a62bb4d19. The Windsor Star. Aug. 1975. Too Much Energy, Too Soon, A Hazard., available at http://news.google.com/newspapers?id=IjU_AAAAIBAJ&sjid=jFEMAAAAIBAJ&pg=3972,2528093&dq=john+holdren&hl=en. Whether these schemes reduce emissions remains at best an unproven proposition, see below. Juliet Eilperin, Steven Mufson, ‘Clean energy sector keeps eye on funds that sustain it”, Washington Post, October 23, 2010, http://www.washingtonpost.com/wp‐dyn/content/article/2010/10/23/AR2010102303287.html. Edward Glaeser, “Why Green Energy Can’t Power a Job Engine”, New York Times, January 18, 2011, http://economix.blogs.nytimes.com/2011/01/18/why‐green‐energy‐cant‐power‐a‐job‐engine/. Saqib Rahim, “TRADE: U.S. may reap rewards of clean technology, but not necessarily in manufacturing”, Climate Wire, September 16, 2010 http://www.eenews.net/climatewire/2010/09/16/4. See “First Solar’s CEO Discusses Q3 2011 Results — Earnings Call Transcript”, Seeking Alpha, November 3, 2011, http://seekingalpha.com/article/305197-first-solar-s-ceo-discusses-q3-2011-results-earnings-call-transcript. Eric Reguly, “Austerity pulling plug on Europe’s green subsidies”. The Globe and Mail (CA), January 26, 2011, http://www.theglobeandmail.com/report‐on‐business/commentary/eric‐reguly/austerity‐ pulling‐plug‐on‐europes‐ green‐subsidies/article1883888/. “Weekly Address: Solar Power & a Clean Energy Economy”, White House, October 2, 2010, http://www.whitehouse.gov/blog/2010/10/02/weekly-address-solar-power-a-clean-energy-economy. “Es wird dunkel in Deutschland”, Focus (Germany), January 22, 2010, http://www.focus.de/immobilien/energiesparen/stromversorgung-es-wird-dunkel-in-deutschland_aid_592633.html. Open Europe, Press Summary, January 27, 2010. See, e.g., “Energie-Agentur Warnt vor Netz-Kollapse”, Berliner Zeitung (Germany), October 17, 2010. Vance, et al. “Economic Impacts from the Promotion of Renewable Energy Technologies: The German Experience”, RWI‐Essen, November 2009, http://repec.rwi‐essen.de/files/REP_09_156.pdf. See also Hillebrand et al., “The expansion of renewable energies and employment effects in Germany”, Energy Policy 34 (2006) 3484‐ 3494. George Monbiot, “Solar PV has failed in Germany and it will fail in the UK: Our tariff plan is near‐identical to Germany’s – that’s the one that produced woeful amounts of energy, jobs and innovation”, Guardian, March 11, 2010, http://www.guardian.co.uk/environment/georgemonbiot/2010/mar/11/solar‐power‐germany‐feed‐in‐tariff. Citing http://hn.ihned.cz/c1‐49683010‐globalni‐ulet‐bruselu, and also Frankfurter Allgemeine‐Zeitung, http://www.faz.net/s/Rub0E9EEF84AC1E4A389A8DC6C23161FE44/Doc~E817DC35BF80D4BE0932A4B57C74BDFC A~ATpl~Ecommon~Scontent.html. From an email by John Constable to this author. Referencing John Constable, Green Collar: The Prospects and Character of the Low Carbon Economy (Civitas: London (2011)). 18 See: http://ec.europa.eu/energy/renewables/studies/renewables_en.htm. For the word “slight” see p. 24 and 25 of the summary. See: http://ec.europa.eu/energy/renewables/studies/renewables_en.htm. For the word “slight” see p. 24 and 25 of the summary. See: One Million Climate Jobs: Technical Note: Jobs Gained and Lost (2010), see also www.climate‐change‐ jobs.org/node/14. John Constable, “Renewables won’t keep the lights on”, Standpoint (Jan.‐Feb.2011), 54‐55. http://www.standpointmag.co.uk/node/3639/full. See, e.g., “Is Germany’s Green Energy Plan Failing?”, Der Spiegel (Spiegel Online International), November 10, 2011; and German Solar Firms Eclipsed by Chinese Rivals”, Spiegel Online International, September 7, 2011. See, e.g., “Is China’s Green Energy a Myth?”, Institute for Energy Research, October 3, 2011, http://www.instituteforenergyresearch.org/2011/10/03/is-china’s-green-energy-a-myth/. See, e.g., The Australian, The greening of China a mirage, September 19, 2011, http://www.theaustralian.com.au/national-affairs/opinion/the-greening-of-china-a-mirage/story-e6frgd0x-1226140342005. Although e.g., President Obama calls wind and solar ‘new’ technologies, even utility industry promoters of renewable mandates will dispute that, for example, Southern California Edison calls solar PV a “mature” technology, in its PUC filings. http://www.renewable energyworld.com/rea/news/article/2011/02/solar‐pv‐becoming‐cheaper‐than‐gas‐in‐california. See, e.g., “State of the Union’s Energy History”, Institute for Energy Research, January 25, 2011, http://www.instituteforenergyresearch.org/2011/01/25/state-of-the-unions-energy-history/. See “Solar Power Seen Meeting 20% of Needs By 2000; Carter May Seek Outlay Boost”, Wall Street Journal, August 22, 1978, at “The Washington Post Discovers the Problems With Energy Subsidies”, Institute for Energy Research, June 26, 2009, http://www.instituteforenergyresearch.org/2009/06/26/the-washington-post-discovers-the-problems-with-energy-subsidies/; headline available at http://www.instituteforenergyresearch.org/wp-content/uploads/2009/06/clip-image0021.jpg. See, e.g., “Why wind power does not deliver the expected emissions reductions”, Herbert Inhaber, Renewable and Sustainable Energy Reviews, volume 15, pages 2557–2562 (2011), http://www.sciencedirect.com/science/article/pii/S1364032111000864, affirming results from Colorado, Texas, Germany, Ireland, Estonia and other countries that as the proportion of renewable energy penetrating the electricity grid grows, the reduction of CO2 emissions drops sharply. By the time windpower (and, by analogy, solar) reaches about 20 percent of the grid, the savings in CO2 emissions are negligible, of the order of a few percent. In the same way, when back-up electricity (mostly natural gas power plants) – for the times the wind doesn’t blow and the sun doesn’t shine – is ramped up and down, there are more CO2 emissions compared to when the back-up is running full blast. Result – much of the emissions savings from using windpower or solar is lost. See also “The Wind Energy Paradox”, Bentek Energy http://wyia.org/wp-content/uploads/2011/05/brannin-mcbee.pdf. Bentek of Lakewood, CO found that the uses of wind energy is dirtier than natural gas or coal at least in that state. The reason is that, even in Colorado, the wind does not always blow — or sometimes it blows too hard. Either phenomenon causes wind generators to shut down, requiring the fossil fueled ‘reserve’ power, which is kept running inefficiently at all times for this purpose, to kick in to keep the lights on. Treating coal and gas as intermittent renewables requires cause them to emit more pollutants than they would if they ran continually without wind energy in the mix. Similarly, wind energy not only increases air pollutants, but it also greenhouse gases. Naturally, the renewable energy industry disputes these assertions, which also have the benefit of being logical — this compares to stop-and-start vs. city driving — but cannot disprove them. Stephen Power, U.S. Weighs Funding for Renewable Energy Projects, Wall Street Journal, Nov. 3, 2010, http://online.wsj.com/article/SB10001424052748703506904575592843603174132.html. “Wind Jammers at the White House: A Larry Summers memo exposes the high cost of energy corporate welfare”, Wall Street Journal, November 12, 2010, http://online.wsj.com/article/SB10001424052748704635704575604502103371986.html?KEYWORDS=browner.